PECO OO GAUGE CODE 100. 1 LARGE DIAMOND CROSSING (insufrog) to make. a RIGHT HAND DOUBLE CROSSING. 2 LARGE RADIUS RIGHT HAND POINTS SL-E88. Used (Tested) Good Condition. No Fishplates. Condition is New. 1 standard left hand point. 1 standard right hand point.no 873. Tri-ang Hornby R491 Right Hand Points. Model Railway. Currently we have over 10,000 products available on line. The cheapest way of transporting will be chosen. No.2 Radius Right Hand Point. OO/HO Gauge. Here we have by Tri-ang Railways, R491, a Right Hand Point, Hand Operated, Super 4. Hornby Trains Sets. 2x RIGHT HAND POINTS. Plastic Model Kits. Sylvanian Familes. Tamiya RC Cars. Sylvanian Families. Condition Used - with a missing sleeper end. Goods will be well protected. And neody magnets for airfix, lima, Bachmann, triang, Hornby, wrenn, Dublo, mainline, trix, locos now available from locospares. For more spares. 2 right / 3 left / 1 uncoupling / 2 for the level crossing. HORNBY -OO/HO Gauge, Nickle Silver rail, 2-Rail - Unused, R8073 RIGHT HAND POINT - boxed. MPN: R8073. Condition: The point is unused, complete, clean, boxed. Item: Right Hand Point. 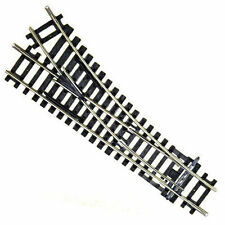 Peco Streamline SL E88 Right Hand Large Radius Turnout HO/OO Nickel Silver. HORNBY -OO/HO Gauge, Nickle Silver rail, 2-Rail - Unused, R8075 RIGHT HAND CURVED POINT - boxed. MPN: R8075. Item: Right Hand Curved Point. Condition: The point is unused, complete, clean, boxed. HERE IS A HORNBY DUBLO 2731 OO 2 RAIL ELECTRIC SWITCH POINT R/H BOXED. THIS SALE IS FOR ONE DIAMOND CROSSING BOXED. 5 AVAILABLE. ALL RAILS ARE VERY GOOD USED CONDITION ALL HAVE THEIR CONNECTORS AND SLEEPERS INTACT, WILL BENEFIT FROM A CLEAN, BOX GOOD WITH AGE WEAR. Small Radius Turnout, R/H Insulfrog. Nominal radius: 610mm, Angle: 12 degrees, Length:185mm. We will always help you to have a 100% positive happy buying experience. Our Code: PESL-91. Part Number: SL-91. All is new production. All is Nickel Silver On Steel. A note about scale - UK N Gauge is 1:148, International N Gauge is 1:160. Diecast, Kits, Railway, Slot Racing and RC Specialists. N0.2 Radius Turnout R:438mm A:22.5 degrees L:168mm Right hand. Scale / Type: OO Scale. We will always help you to have a 100% positive happy buying experience. Our Code: PEST-240. Part Number: ST-240. PECO STREAMLINE SMALL RADIUS RIGHT HAND POINT `00` GAUGE CODE 100 RAIL INSULFROG SL-91. It would be a useful addition to any layout. Peco SL-91 Code 100 Insulfrog Small Radius Right Hand Point (OO gauge) Small radius right-hand point. Nominal radius: 610mm (24in) Angle: 12º Length: 185mm (7 ¼in). OO gauge Code 100. 80 thou (.080") 2.0mm thick clear plastic card. Hornby Trains Sets. TOP categories. Sylvanian Familes. Tamiya RC Cars. Sylvanian Families. Plastic Model Kits. Code 100 Electrofrog. Peco Streamline SL-E88. Large Radius Right Hand Point. SL-E88 Peco Large Radius Right Hand Point Electrofrog code 100 rail 00/H0. Used model railways & collections always wanted. HS1-9, IV41-53, 55-56, KA27-28, KW15-17, PA20, 41-49, 60-78, PH42-44, ZE1-3 (48-120 Hours subject to ferry schedules and weather) Up to 20 kilos £25.99. Item No: R8078. Hornby Model Railway Accessories. Hornby points are supplied for operation by hand. OO/HO Gauge. We will always find the cheapest quote based on the weight of your item. Add to Favourites.